When Chicago needs eye care, they turn to Rosin Eyecare’s Wheaton eye doctor. With years of experience in providing quality eye care, our Wheaton optometrists will give you and your family personalized care that ensures healthy vision. We offer a full-range of eye care services from skilled professionals who are passionate about helping their patients achieve clear sight. Our Wheaton location is so dedicated to our patients, that we even offer appointments on Saturdays to accommodate your busy schedule! Rosin Eyecare has a long history of giving the Chicago community a trusted eye care center where the whole family can receive eye exams, vision correction services, and even eye disease prevention and management. At Rosin Eye Care: Wheaton VCA, we uphold Rosin’s values of patient-first care and outstanding customer service. Our Wheaton eye doctors are experts in their field who take the time to listen to their patients to truly understand your unique eye care needs. 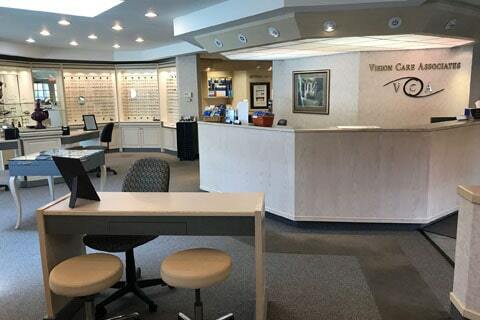 A trip to Rosin Eye Care: Wheaton VCA is a step towards better vision and healthier eyes. These thorough eye exams allow us to gain an accurate understanding of the health of your eyes and the prescription you need for better vision. We combine this information with your family history of eye diseases in order to customize a treatment plan that works for your eyes and your overall health. Call us today at (630) 653-8885 to schedule your next appointment or stop by your Rosin Eyecare doctor located at 1706 Roosevelt Rd in Wheaton. *From the West: From Geneva, IL take IL-38 E/W State St east towards Prairie Landing Golf Club. Continuing east where W State St becomes Roosevelt Rd you will pass Robert R. McCormick House and Amber Dental of Wheaton. While still headed east on IL-38 E, you will find us located on the right next to Papa Win Groceries. *From the South: Head north on Briarcliffe Blvd passing Briar Patch Park. Turn right onto S Blanchard St and continue north towards E Roosevelt Rd. Take the right turn onto E Roosevelt Rd and continue past Midas. We will be located on the right next to Taqueria San Miguel.